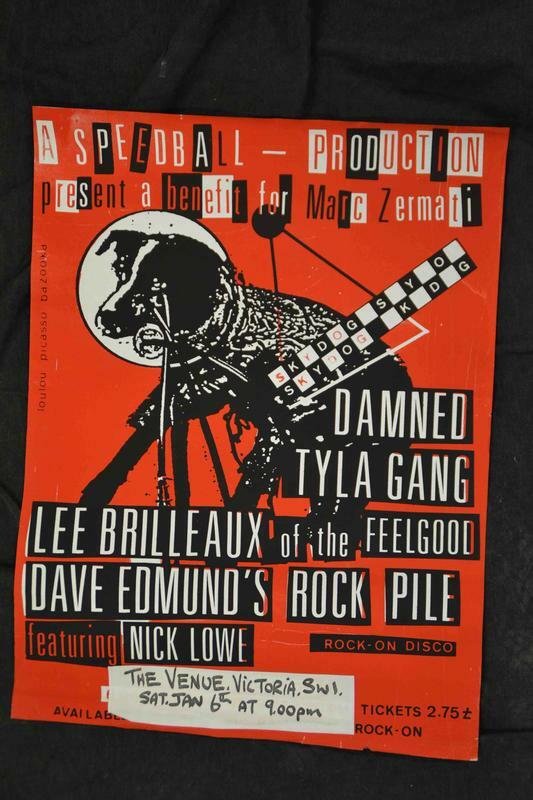 Damned -Live Poster London The Venue 6th of January 1979 Benefit gig for Marc Zermati ( legendary promoter of Mont de Marsan festival ) support by Lee Brilleaux/ Dr Feelgood, Tyla Gang, Dave Edmunds Rockpile featuring Nick Lowe etc. Classic Damned gig . One of three gig after their re-union were they sold the "Dodgy demos" single trying to launch their new sound soon to emerge in to the classic "Machine Gun etiquette"-album. 100% original screenprinted poster on fragile paperstock. Very few copies can have survived. Vibrant colours. Size 56 x 75 cm Excellent condition. Have never been used and stocked rolled for 34 years. Only a few creases and a few tears of a couple of millimeters each. No bits are missing and will be Excellent+ if framed.